The monk seal of the day was big and molting. Hawaiian monk seals are actually pretty difficult to find on Oahu. More often than not, it comes down to plain luck. It’s just too crowded here for these people-shy creatures. But if you’re really lucky, you’ll run into a monk seal that won’t care about all the people standing around gaping at it. Kaimana beach in Waikiki gets the occasional monk seal visitor and once in a while you’ll run into them basking in the sun along the North Shore. But if you want to increase your chances of seeing a Hawaiian monk seal while in Oahu, head to Kaena Point. It’s common to spot them here lazing about in the sun. I hope you’re as lucky as I was! 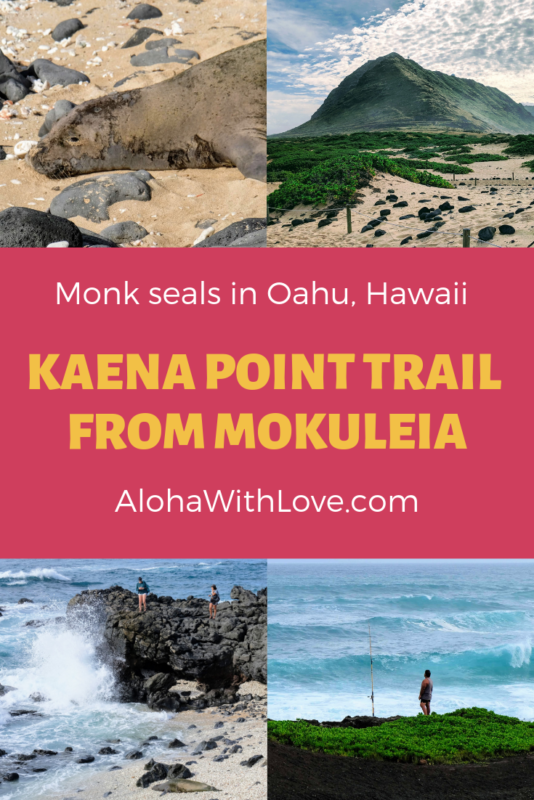 This post is about reaching Kaena Point from Mokuleia. 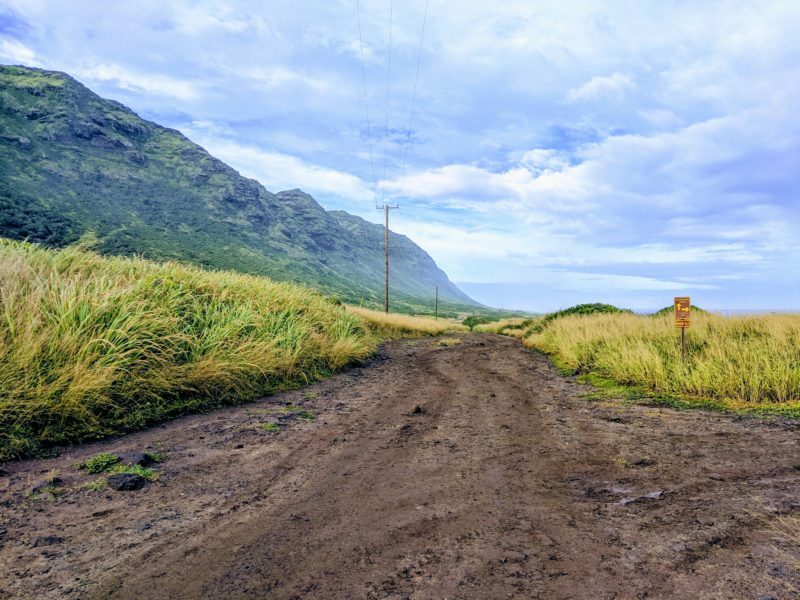 I also have a post on how to reach Kaena Point from Makaha (the other side of the Waianae mountains). Please read: There’s no official law that states how far away you need to be from a Hawaiian monk seal. But for your safety and the seal’s protection, the DLNR recommends that you stay at least 150 feet away. Avoid sudden movements, loud noises and any actions that could potentially make the seal nervous. There are only about 1200 of these guys alive today and any interference directly affects those numbers. Visit the DLNR website for more. Hawaiian monk seals don’t just hang out at the point. I’ve seen them everywhere from sandy beaches to pointy black lava rock along the trail. If they’re still wet, they’ll be difficult to distinguish from a wet lava rock. It also doesn’t help that once they’re out of the waves, they don’t really move. I’ve often mistaken a black lava rock for a monk seal and vice versa while on this hike. Local Tip: Along this trail, you’ll spot local fisherman enjoying the early morning view and doing some last minute fishing before it gets too hot. I spoke with a couple of them on my way and one of them had seen a baby monk seal just the day before. He pointed the area out to me so I could take a look. No baby monk seals for me but now you know that the fishermen have the inside info. There are 2 ways to reach Kaena Point. The fastest is a straight dirt (and sometimes muddy) path running parallel with the mountains. Although this is the quickest, your chances of seeing a Hawaiian monk seal or even the ocean is zilch as you’re too far away from the sea. Every so often the trail path will veer off to the right, bringing you closer to the ocean. Your hike will take longer, but the oceanside view is worth it. Each path rejoins with the main trail like a semi-circle and it’s possible to walk each one of them if you’re willing and able. Local Tip: The best turns where I’ve seen a Hawaiian monk seal is at the end of A-5 and at the beginning of C-1 (each turn is labeled). 2 girls look down at the Hawaiian monk seal from the other side. Pig tracks and I even heard a pig squeal and run away when it heard me coming near. The Waianae mountain range all the way down to the point. Sea birds calling out to each other along the mountain cliffs. Tall grasses and small bright flowers blooming. Believe it or not, extremely weird looking trees clustered together near the 2nd half of the trail. It reminded me of a desert. Fishermen camped out under pop-up tents and in their vehicles enjoying their coffee, breakfast and fishing. Crashing waves along the shore. The waves were huge that day! Small crabs, rock skippers (o opu), hermit crabs and sea snails (pipipi) in tidepools. The straight dirt path on Kaena Point trail. Kaena Point is actually fenced in from both sides to protect the seabirds here from wild cats, dogs, mongoose, rats and trampling pigs. Some of the birds here nest underground so both they and their eggs are vulnerable to predators. Even the walkways are marked by ropes so hikers do not inadvertently destroy a nest. 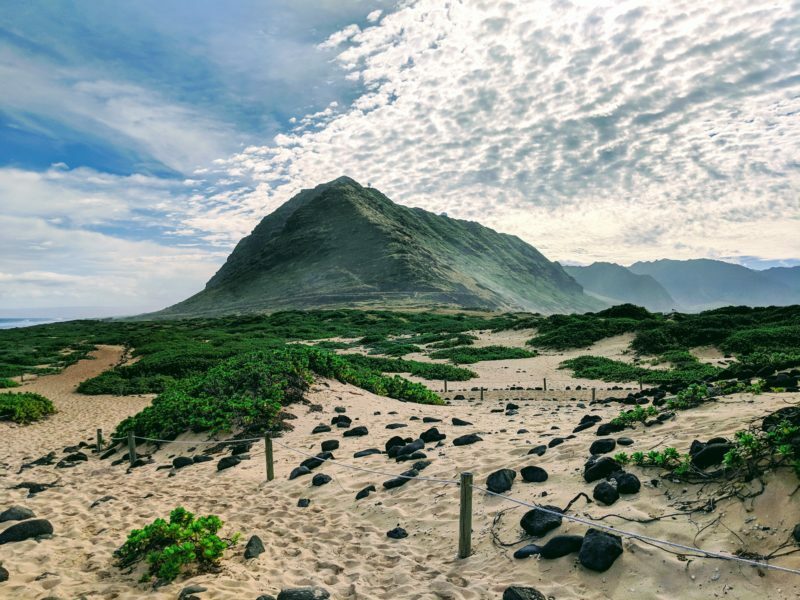 If you’re interested in seeing the shearwaters and albatrosses that call Kaena Point home, check out my other Kaena Point post about hiking from Makaha to find out more. I was lucky and saw adults and huge albatross chicks up close! Local Tip: At the point there’s a tall tower that you can walk to. Behind that tower is a small beach, which is where I spotted the monk seal at the top of this post. It’s also a great lookout point. Standing at Kaena Point and facing the Waianae mountain range. Sunscreen and a hat. It gets hot on this hike fast. There’s no shade readily available so I recommend going as early as possible. It’s really easy to get burned on your face and the back of your neck. Bring enough water to keep you hydrated. You’ll be sweating it all out especially if you get a late start. 1 liter of water was just enough for me. Wear sturdy shoes. The elevation is flat here, but the ground is very uneven due to tire tracks, shoe prints and dried puddles. Consider hiking Kaena Point if the weather forecast for downtown Honolulu is rain. The point is so far away from the rest of Oahu that often the weather is different to the rest of the island. Just search for “Mokuleia weather forecast”. If you stay on the main path all the way, it will take about 1 hour to reach the bird sanctuary. I walked on almost all the side paths and it took me 1.5 hours to reach the sanctuary (I spent a lot of extra time taking photos and just admiring the view). January, February and March are some of the best times to look for whales at this point. Pick a clear day so you can see as far out as possible and scan the horizon for their signature “puff” of air. Here’s a short guide on whale watching in Hawaii. What a view! A lone fisherman admiring the view. 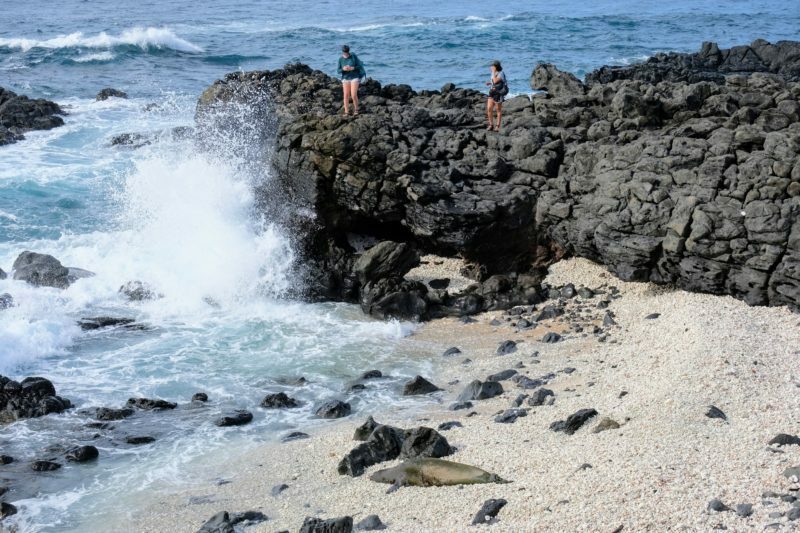 It’s a flat walk to Kaena Point and back (from both access points) and it’s a popular hike for large groups or families traveling with small children. I’ve even seen lucky babies being pushed in those jogger strollers with ease. After the hike, I recommend heading to Kono’s North Shore for some 12-hour slow-roasted kalua pork! Have you already tried this hike? Let me know what you thought in the comments below. 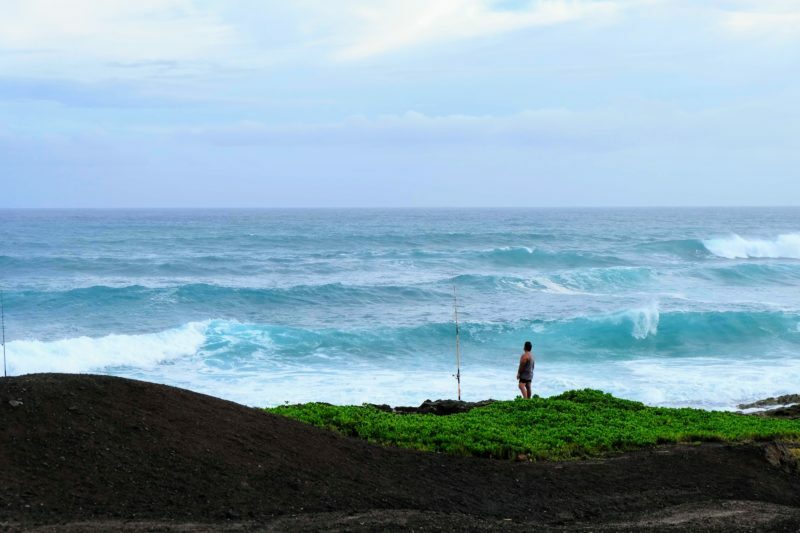 If you enjoyed my post on reaching Kaena Point from the Mokuleia access point and plan to visit Hawaii someday, sign up below to get my local Hawaii tips. It’s free and I can’t wait to help you plan the perfect Hawaii vacation.